In 1906, developer Cord Meyer bought up a patch of 600 acres and christened it “Forest Hills,” for its proximity to Forest Park. The Cord Meyer Company set out to develop Forest Hills into a suburban oasis outside of Manhattan. 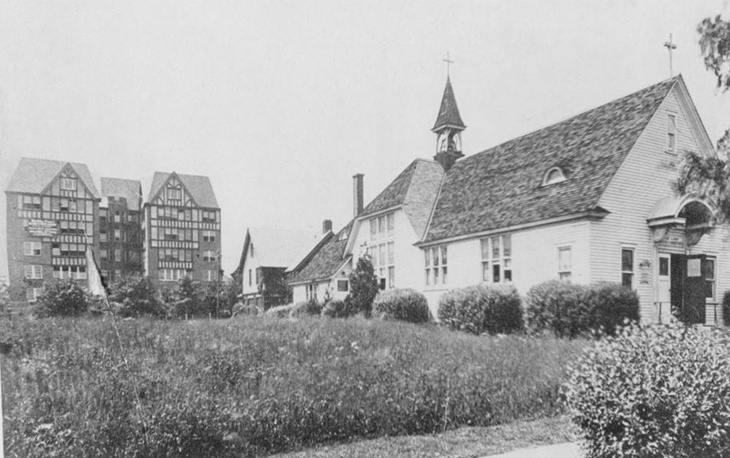 A portion of it was to become Forest Hills Gardens, designed by Frederick Law Olmsted, Jr., to resemble an English garden community. There would be single-family homes, and garden apartments, and eventually a railroad station. The original white church. Photo courtesy Rego-Forest Preservation Council. In 1912, as people were still venturing into the wilderness of Forest Hills, building homes on the north side of Hoffman Boulevard (later renamed Queens Boulevard), they began to want more than just housing. They wanted a community. The Catholics among these early pioneers formed a parish community of the faithful. Then they needed a church. In 1916, the original white chapel of Our Lady Queen of Martyrs was built at the corner of Ascan Avenue and Queens Boulevard. By 1917, our founding pastor, Monsignor Joseph McLaughlin, opened negotiations for the purchase of land for the future development of the parish as it exists today. He opened our school in 1928 and a decade later announced plans to construct a new church and rectory. The new church (our present-day church) opened for worship on November 5, 1939. 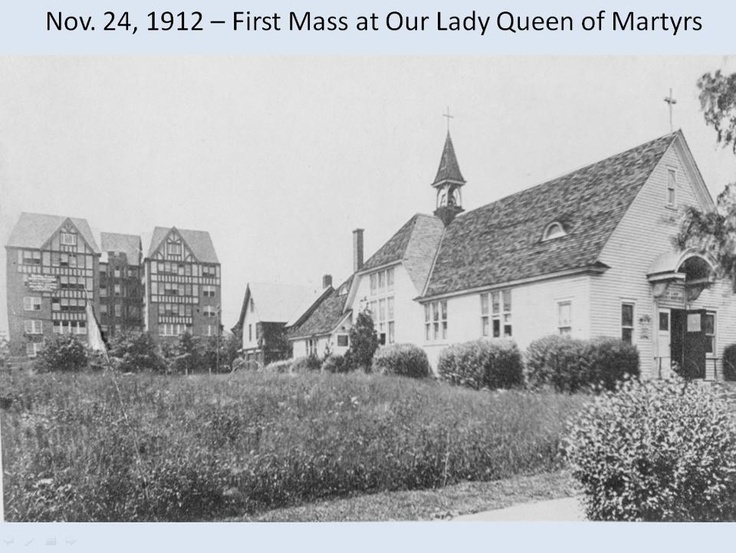 Did you know Our Lady Queen of Martyrs church building itself (constructed in 1938-39) was modeled after the English Gothic cathedral at Durham? Night view of the current church complex which spans one full block. Photo courtesy Michael Perlman, Rego-Forest Preservation Council.